retired nurse’s aide placed her first bet, she tripped on a hotel bedspread and fell into a complicated and largely overlooked legal quagmire: sovereign immunity. As tribes across the Northwest expand their commercial operations, drawing thousands of visitors to Indian Country for concerts and gambling, the potential for conflicts over differing legal systems has grown. Lawyers on all sides of the issue say tribes, including the Coeur d’Alenes, work hard to avoid clashes by providing hefty insurance policies to negotiate acceptable remedies. But from a strictly legal standpoint, customers walking through the doors of a tribal casino are stepping onto foreign soil. The U.S. government has long recognized American Indian tribes as essentially foreign governments. The theory holds that their tribal nations existed long before American patriots wrote the U.S. Constitution and forced the tribes onto reservations through a series of treaties and wars. As a result, each tribe in Washington and Idaho has its own constitution and tribal court system, often without the explicit mandate found in the U.S. Constitution that the judiciary be protected as an independent branch of the government. That means that most tribal leaders retain the right to overrule any decision reached in their tribal courts. Representatives from three of the four major tribes with casinos across the Inland Northwest said they carry insurance policies designed to cover potential liabilities they might face in the event of personal injury claims to avoid even raising the issue of sovereign immunity. But they all acknowledged that if their insurance carriers deny a claim, like in the Tollett case, the legal disputes are funneled into tribal courts. Some tribes have actively sought to professionalize their court systems. “A number of years ago, the tribe was concerned with the whole idea that tribes always hide behind sovereign immunity and you don’t get a fair shake when you go to tribal court,” he said. The Kalispel tribal council adopted a tort claims code that provides clear procedures on how to bring civil lawsuits in tribal court. The council also now requires tribal judges to be trained in law and to be members of the Washington Bar Association, he said. Joe Pakootas is the chief executive officer of the Colville Tribal Federal Corporation, which is a business arm of the Confederated Tribes of the Colville Reservation. It manages three casinos at Mill Bay, Coulee Dam and Okanogan. Pakootas said the tribe wants its insurance to reimburse customers for any legitimate injuries to avoid the inherent controversy over sovereign immunity. “Somebody may trip or fall or slip off a stool. We will usually call an ambulance. If they don’t want one, we’ll have them sign a waiver,” Pakootas said. Although few people, if any, ask about the liability risk when they enter the casinos, the last thing tribal officials want is to have customers stop coming out of fear of the different legal system or to give state or federal officials a reason to challenge the tribe’s sovereign immunity, which is highly guarded, he said. “We want to make sure everyone feels safe and they don’t have to worry about any kind of accidents,” Pakootas said. The Spokane Tribe, which operates casinos at Chewelah and Two Rivers near Fort Spokane and has proposed building another in Airway Heights, did not return calls requesting comment. Gary Tollett, 55, said he and his mother often visited the Coeur d’Alene Casino in Worley. “I had a job and my mom was retired and healthy. We always had a great time,” he said. On July 5, 2007, Tollett said, he and his mother, Dorothy Tollett, of Spokane Valley, made the drive to beat the searing summer heat. Upon arriving, they learned a hotel room was immediately available. The first room they were given was not yet cleaned, and a maid directed them to a second room that she assured them was ready, Gary Tollett said. When he opened the door, the room was dark and his mother tried to walk around her bed when her feet got caught in a bedspread on the ground. She fell face-first to the ground. After her fall, Dorothy Tollett complained of soreness in her shoulders, and someone her son described as an emergency medical technician came to her room to check her out. Thinking she just had a sore shoulder, the EMT suggested ice and brought some into the room. But the pain persisted, and Gary Tollett and his sister eventually took their mother to Valley Hospital and Medical Center, where they learned both of her arms were broken. Deciding against surgery because of her age, doctors placed Dorothy Tollett in slings immobilizing her arms across her chest to allow the bones to heal. Gary Tollett said he took a leave of absence to care for his mother, who required 24-hour assistance. She developed a bedsore in the months it took to heal. 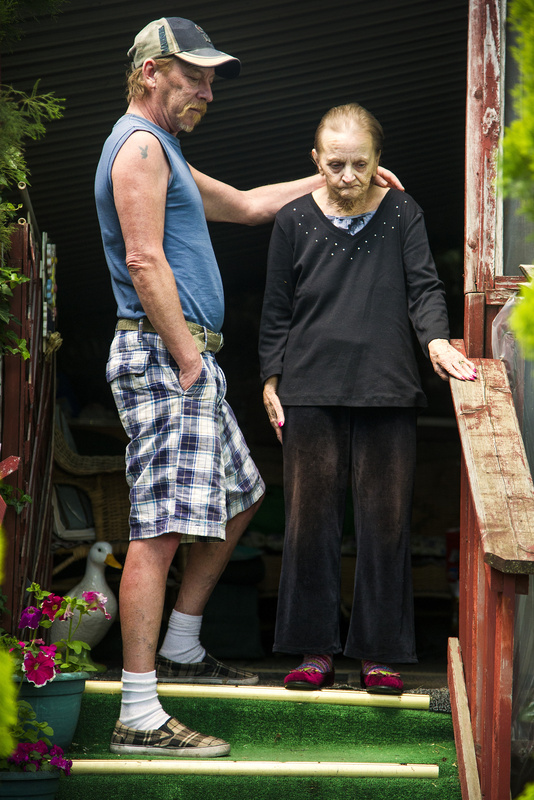 “My sister and I had to provide home care for months,” he said. Dorothy now requires a wheelchair to leave home. The injuries ended the family’s many camping outings, and now either Gary Tollett or his sister Darlene Beldin must be home to care for their mother, who retired in the early 1990s. “It ruined my life,” Dorothy Tollett said. Douglas Spruance, Dorothy Tollett’s Spokane attorney, estimated the cost of her medical care between $60,000 and $80,000. He contacted the Coeur d’Alene Tribe and followed procedures to file a claim with the casino’s insurance carrier, which eventually was denied. “She had a really tough time, medically,” Spruance said. With no resolution, Spruance filed the lawsuit in 2009. It took two years to get the case before Coeur d’Alene Tribal Court Chief Judge William J. Douglas. Then, just a few months before trial, defense attorneys hired by the tribe filed a demand that the court dismiss the case under sovereign immunity protections. Knowing he had no case law to back him up, Spruance reached out to the tribe’s attorneys to seek reimbursement for Tollett’s medical bills. “Just as it protects the federal, state and local governments, sovereign immunity is intended to protect tribal governments from frivolous lawsuits,” she wrote. “It is something the Coeur d’Alene Tribe invokes only with good reason. “In Ms. Dorothy Tollett’s particular case, our insurance company investigated the claim, determined it was without merit and chose not to settle the case outside of court,” Keen wrote. Spruance said he struggled with the decision.